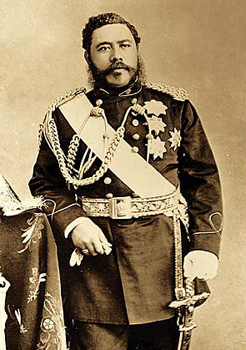 His Royal Highness David Kalakaua, King of Hawaiian Islands (member of Le Progres de L’Oceaniea Lodge No. 124, a red lodge in Honolulu that was initially chartered in 1842 by the Supreme Council of the Scottish Rite in France) was accompanied by the Governor of Maui, John M. Kapena of Lodge No. 21 in Honolulu on December 30th, 1874 for a Special Communication of New York Lodge No. 330, the mother lodge of Brother Edwin T. Booth, (1833-1893) a Shakespearean actor and co-founder of the Gramercy Park Players Club with Mark Twain and noted architect of Booth’s Theatre on 23rd St & 6th Avenue which would serve as a duly consecrated Masonic Temple for Lodge No. 330. 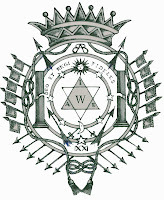 Days later on January 5th, 1875, King Kalakua was proposed for Honorary membership in Saint Johns Lodge No. 1 Ancient York Masons and was elected at the following communication. * On January 14th, King Kalakua was initiated into St Johns Conclave No. 1 for the Order of Red Cross of Constantine in Chicago, Illinois and made a Viceroy and Sovereign at the hands of Jonathan J. French, Past Grand Sovereign and Intendant General and founder of the Matier Royal Provincial College in Illinois in 1878 under the Societas Rosicruciana in Scotia. These events mounted to a crescendo of sorts when a special meeting of the Grand Council of the Red Cross of Constantine of Scotland was called on September 10th, 1881 where the King was made a Knight Grand Cross. *Kalakaua's acknowledgment of this honor was received on April 20th, 1875 and spread upon the minutes of the lodge.